Oh goodness. You've caught me on the day I share my Mid-Atlantic Mod haul. 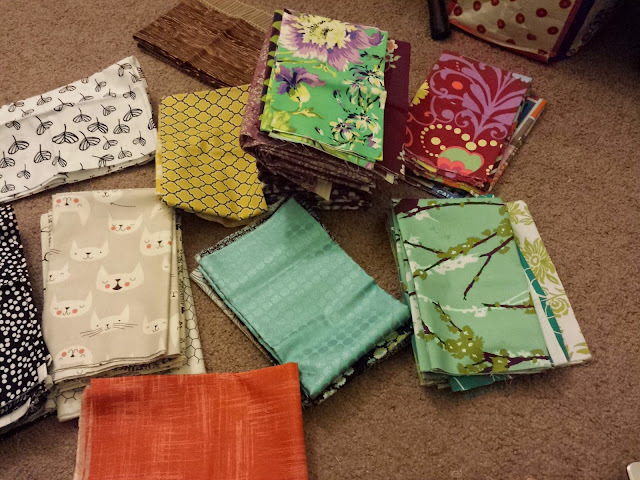 I'm a little embarrassed about how much more fabric I actually brought home. And I brought a LOT of fabric to the retreat because I was trying/failing to make decisions on my medallion. Ah, fabric. My guild friend Sonia (@soniabegoniasonia on IG) gifted me the sewing machine fabric on the bottom - gah! I need to make something with this very soon! Thank you, friend! <3 Oh and by the way... those purple cathedral windows on the bottom right... I can't handle how awesome they are. These two pictures are all of my winnings (thanks to Windham Fabrics for the beautiful Lotta Jansdotter "Sylvia" bundle and to the Intrepid Thread for the Alison Glass Lucky Penny FQ! 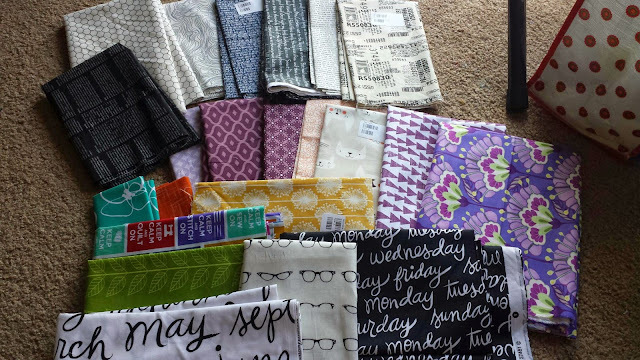 ), plus half yards, lots of FQs, and some fat eighths from Burkholder's and The Sassy Tassel. I bought yardage of purple Lecien fabric (bottom, first picture - YUM) to make a top. The Sassy Tassel also had OOP Amy Butler "Love" (which I mostly missed out on because it came out before I was sewing), AMH "Innocent Crush" (clearly there's never too much of that around here) and Joel Dewberry "Modern Meadow." Thanks, Sassy Tassel! I overloaded on purples (because awesome purples are hard to find [though getting easier to find] and they are my favorites), and low volumes (yes, I finally bought a piece of Catnap!!). I've been going through LVs like crazy since last November when I made Pumpkin Spice Latte. The Botanics quilt ate up a lot too, so I had to shop… right? I can't get over the "8 Days a Week" fabric from Windham at the bottom of the first picture. It's almost as exciting as the Britten Nummer print from Ikea (that is sadly becoming discontinued :( ). After this, I literally cannot stuff more than maybe 5 half yards more into my fabric cabinet. 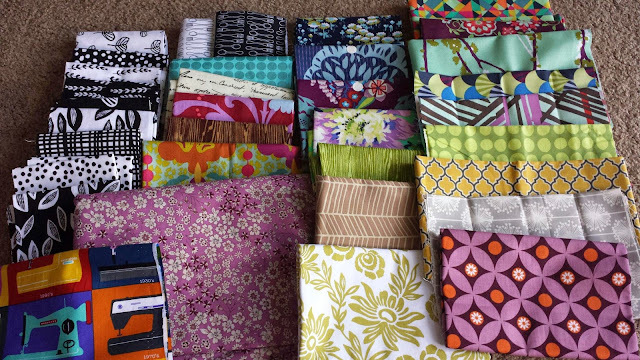 I'll either need to use a bunch of this fabric en masse or just get more storage… lol? So, what are you stashing this week? I'm linking up to Sunday Stash @ Molli Sparkles! So many beautiful fabrics. I can understand why you came home with so much. When you purchase fabric and don't really know what it will be used for, how much do you buy? Stopping by from MS linky Sunday Stash report. Time for more storage ;-) Love it all! yum, so many great scores. I definitely don't remember you buying this much, lol. It must have multiplied in your trunk on the way home. Sister Quilt #2 - Quilt top! Who is the "modern" quilter? Tote Bag Swap for Mid-Atlantic Mod!